British musician Robert Fripp says “music is the wine that fills the cup of silence” and what better place to enjoy silence and music at the same time other than the northeast (NE) region of India? No big secret that music festivals in the northeast India are perhaps the coolest in the country. The mystical Seven Sisters house the rock capital of India in form of the beautiful city of Shillong. But Shillong’s stature as a music haven is just the tip of the iceberg; the entire NE region is beyond Assam’s record-breaking guitar ensemble and Shillong’s Lou Majaw. The rich cultural heritage of the region with its distinguished communities and tribes clubbed with their unique musical inheritances give the NE a definite edge over the rest of the nation when it comes to diverse form of musical performances. Art needs expression and thanks to the abundance of music and its call for deliverance, NE hosts many annual music festivals across the year (apart from the numerous one-off events). The languages differ, the instruments are not always the same, musical textures are varied; yet there is somehow harmony among the genres and if you are a musician by soul, it’s all you are looking for, right? So why wait, pack your heart and lace up your soul and mark the calendar for these music fiestas. One of India’s unexplored lands, Arunachal Pradesh is home to the sleepy valley of Ziro. 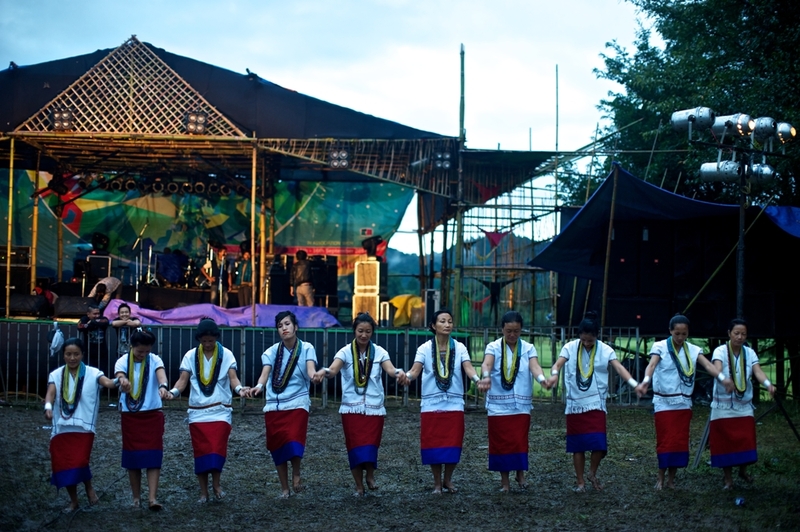 The otherwise quiet air of this place gets filled with joy and music every year in the month of September/ October, when musicians from all over India gather for the famous Ziro Festival of Music. The locals majorly belong to the Apatani tribe of the state and these hospitable folks make sure that your stint with them is a memorable one. An open-air event, the Ziro Festival of Music is a hub for independent musicians, who are not necessarily contractually bound with big music labels. First things first, due to certain political reasons, visitors—both Indian and foreigners—need special permits to enter the state. The permits are issued in the state capital Itanagar, from where it is a 167 km drive to the venue. The best way to reach Arunachal is to take a bus ride from Guwahati or fly to the Jorhat Airport (Assam) and then it is another 70 km drive. Once in Itanagar, a traveller can either book a private cab or hop into a local bus for a journey to Ziro, standing at 5500 ft above sea level! Named after the most popular bird from the NE, Hornbill festival has come up as one of the largest festivals of the Seven Sisters. Musicians from Nagaland are quite underrated and often get overshadowed by the rock bands of Meghalaya and the Papons and Zubins of Assam. This festival is usually held between Dec 1 – Dec 10 in Kisama Heritage Village of Kohima is nothing less than a pilgrimage for the local musicians. Apart from local talents, this gala houses the Hornbill National Rock Concert that sees the participation of bands from across the nation. The venue is located at a distance of 10 km from the capital city of Kohima and travellers can book a cab to the destination. Just picture this—you are amidst the lush green landscape of Kisama, surrounded by the cultural showcase of Nagaland’s 16 tribes, hopping between the music concerts and the famous night market. And you thought Glastonbury is all fun! A word of advice though—opt for bookings well in advance for accommodation in Kohima, as Hornbill Festival is a crowded season for the sleepy village of Kisama. The nearest airport is at Dimapur and you can board a flight from Guwahati. The sandy beaches of Brahmaputra play host to an open air cultural fest every year in the month of either January or February. The festival is celebrated in the backdrop of Assam’s harvest fiesta, the Bhogali Bihu. The Assam Boat Racing and Rowing Association (ABRRA) and the Assam Tourism Development Corporation (ATDC) join hands to organize this event. A great occasion to go outdoors, Brahmaputra Beach Festival is a combination of cultural activities and river/beach-related adventure sports. Music concerts are a major pull of this event and the background with the mighty Brahmaputra and the surrounding hills offer the perfect ambiance to sip in some soothing melodies. And if you have a music overdose, you can indulge in aero sports such as ballooning, paragliding and hang gliding. The entrance to the fest is from Sonaram field, located in the commercially active Bharalu area. For a tip, you should better check in to a hotel near that locality. Public conveyance is not an issue as cabs and auto rickshaws are easily available from anywhere in Guwahati. The weather during that season is very pleasant, but the river wind is a bit wanton at times, so get into some casual and easy-to-move-in clothes. India’s rock capital hosts this mega carnival in the month of October. The dates may drift into the following month as well, but the timeline remains around this section of the calendar. The Meghalaya Tourism Development Forum (MTDF) is the main organizer of this event and the primary objective of the Shillong Autumn Festival is to promote tourism in the state. A vibrant cultural procession by school and college students marks the beginning of the festivities. Keeping true to the status of Shillong as a music hub, Shillong Autumn Festival stages a number of music events, and music connoisseurs flock up to the venues from all corners of the NE. Guitars are often the alternate identity of Shillong, but it is interesting to know that this place has one of the world’s largest collection of drums! Apart from the musical extravaganza, one can indulge in several other activities in the fest such as the Food Festival by Lake Umiam, kite flying, fishing competitions or even stand witness to the fashion shows that offer a perfect blend of the modern and traditional outfits. For flyers, get off on Guwahati airport and take either a bus ride from the bus terminal (located near the famous Purva Thirupati Balaji temple on NH 37) or book a cab from the airport itself. If you are travelling by train, take a cab or a bus from Paltanbazar located near the Guwahati Railway Station. Shillong has a bevy of hotels to choose from but we suggest advance booking for hassle free check-in. A recap of these music festivals of the northeast India makes it evident that all of them take place between September to January every year. This is the perfect time to be in the region as the heat subsides and the torrential rain of the region also recedes, leaving the entire landscape freshly washed and glowing with natural beauty. So, prepare an itinerary, plant detours in between destinations; possibilities are that you could attend more than one music festival.